Stuff, Stuff, and More Stuff. I started back uni which kind of explains my absence. I have been cooking and taking pictures, just not posting, whoops! Anyhoo, we had a potluck a few weekends back, so I thought I'd post some of the stuff from there. 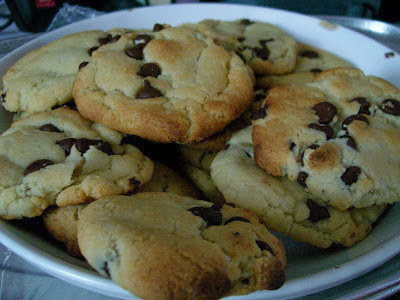 Chocolate Chip Cookies from VwaV. Always a hit. Raspberry Blackout Cake also from VwaV. First time I've made it, and I only had one tiny slice, but it was good. These were brought by our friend. 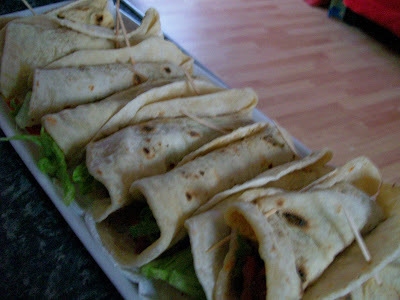 She hand made the tortillas without a tortilla press! They were delicious. Inside them was a mexican beany mixture. Fantastic. I'm not entirely sure what to call this. The inside of the tofu was hollowed out and stuffed with various things (I would say what, but I'm still working on the recipe), and then sealed over with some of the scooped out tofu. It was then marinated and baked wrapped in foil. 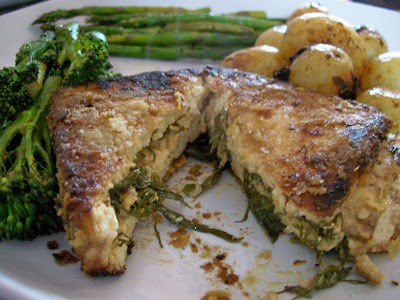 I then dipped it in the remainder of the marinade and dredged it in a flour and nutritional yeast misture and fried it. It was really really good, but the recipe needs a little bit of work. That's an action shot of the stuffing. Ciabatta Pizza - Now With Go Faster Stripes. I spent most of yesterday clearing junk out of our bedroom coz we're moving a few things around, so when it came to dinner time, I wasn't in the mood for anything complicated. Ciabatta pizzas to the rescue! 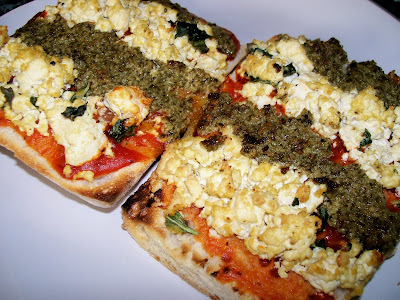 On the pizzas are stripes of basil tofu ricotta and pesto (from a jar). Hit the spot, it did. The Chinese Supermarket is Fun! I love the chinese supermarket, I really do. We went there yesterday and looked at all the cool vegan junk food (it's there! you just have to look). We ended up with a ridiculous amount of junk and not enough vegetables. 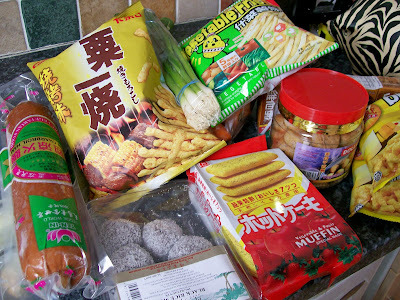 Amongst our haul is yam cookies, black rice mochi, weird looking vegetable and fruit muffins, veggie ham, and weirdly enough, a bottle of Irn Bru (not pictured). Indeed. With all the wonderful stuff we got, I made the Hongshao Doufu (I think that's how it's spelled) from Please Don't Feed The Bears. It was delicious. Gary took some leftovers to work today and I have just been informed that it was much tastier the day after, but it was plenty tasty just cooked too! In an unrelated note, I sometimes like to make things. When I make things I sometimes like to show them off. So that's what I'm going to do. Behold! 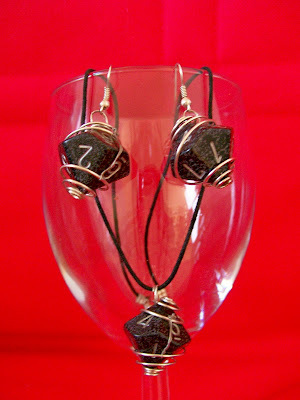 The amazing D10 earrings and necklace! I love these so much! 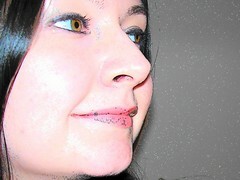 They're so simple but they look quite impressive when I wear them. They're basically three D10's (ten sided dice) wrapped in wire. Brilliant. Love em. I made this bracelet two days ago and went out to the pub wearing it, where it was officially named "The Bracelet What Would Make Mozza My Friend". Apparently it's hard to become his friend, and I decided this bracelet would impress him enough to form a life long friendship. In case you can't tell, that's the vegan society logo. 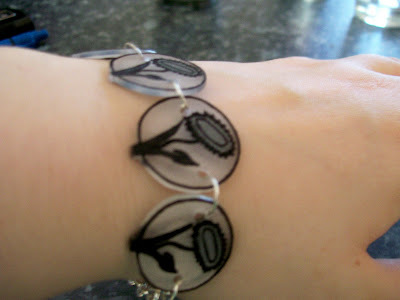 This bracelet probably breaks all kind of copyright laws, but I'm not selling it or anything! *looks scared* You have to catch me first! Ever have one of those days where you feel like you need to eat something with an ungodly amount of fat in it? For me, yesterday was one of those days. New Farm Mac and Cheese to the rescue! Well kinda. This is without a shadow of a doubt the best vegan mac and cheese recipe out there (and it was published in 1988! ), but sweet jeebus there is so much fat in it! I used whole spelt penne (that makes it healthy, right?) 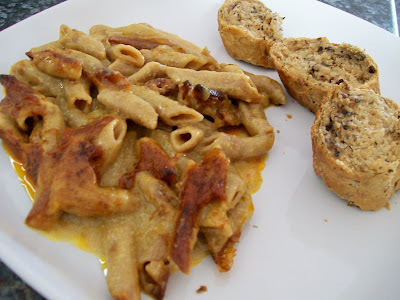 instead of mac, and served it with wholemeal garlic bread (I think I ate one bit). Gary went back for seconds whilst I rolled onto the couch wimpering and having cold sweats. 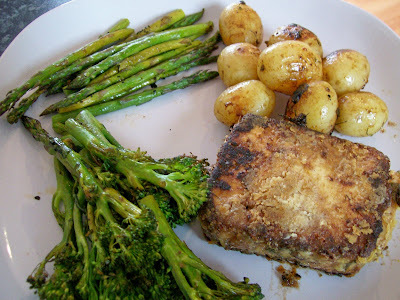 I've blogged this meal before, so sue me! I'm allowed to cook the same meal twice you know! 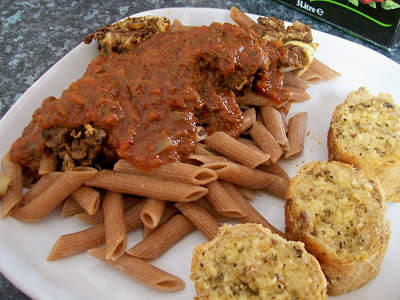 Anyhoo, this is whole spelt penne with arrabiata sauce and meatballs (recipe from New Farm Vegetarian Cookbook), served with wholemeal garlic bread. We couldn't eat it all, but it was yummy. In slightly unrelated news, I'm totally loving being unemployed! I get to cook good food every day, bake stuff, craft stuff whenever I want, and the flat has never been so consistently tidy! It won't last long though, I'm back at uni soon, and I've spent most of the morning today sending my CV off to anyone who'll take it. Anybody in the Tayside area looking for an amateur vegan cook/baker? Part time? No? Didn't think so. 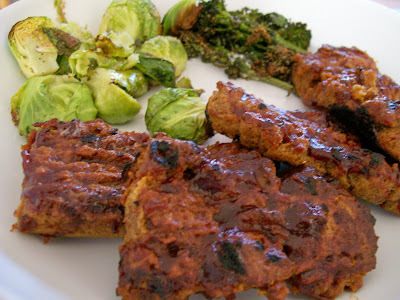 This is that baked seitan recipe from Fat Free Vegan that's been doing the rounds in blog land. It is absolutely amazing. Gary demanded I make another batch right there and then, to which I said "shut up, you fat pie", but you know, I probably could've eaten another batch too. Living in a tiny flat I don't have a barbecue, so I cooked them on my cast iron griddle pan and it worked out just fine. 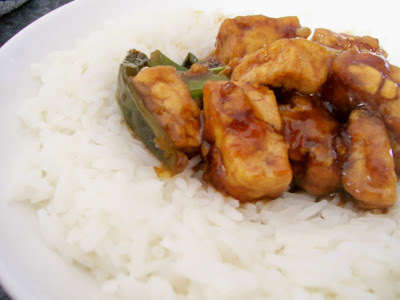 If you haven't tried this recipe yet, you have to try it! Oh, it's served with the leftover vegetables from the other night. Sounds dull, doesn't it? It really wasn't. 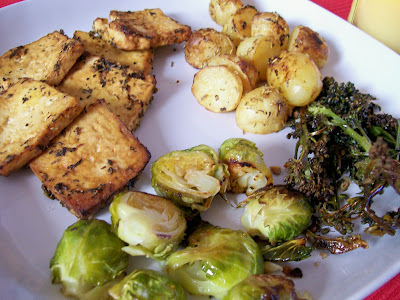 The tofu is marinated and baked, in a random assortment of things I had at hand. Let's see, there was soy sauce, basil, oregano, thyme, lemon, lime, agave, mustard. It was yummy. The potatoes were tossed in a similar sort of mixture before being roasted. The brussel sprouts were roasted with some garlic and sea salt, as was the purple sprouting broccoli. Yum. Some cakes I didn't eat. I've noticed a strange phenomenon every time I bake cakes. I rarely eat any. I don't know why, I just like baking them to give away. Plus I usually eat some of the batter, which makes me feel sick. I baked these to take in on my last day of work. 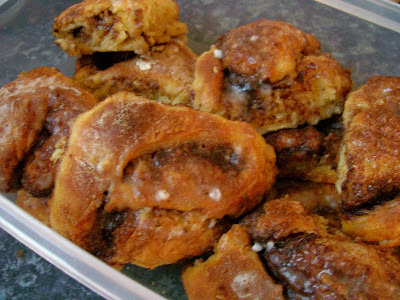 First up are cinnamon buns. 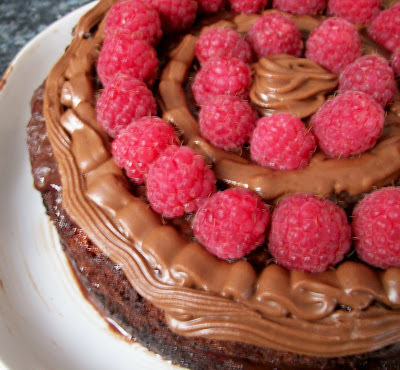 This is a recipe that was posted on the Vegan Freak Forums. One girl at work said that these were the best thing she'd ever put in her mouth. Praise indeed. 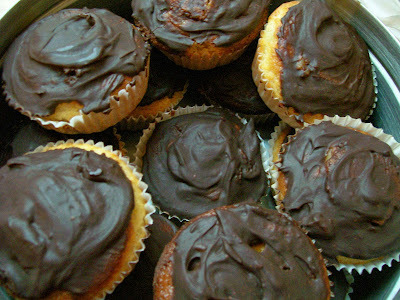 Next up are Orange Pudding Cupcakes which I made on the request of one of my colleagues who'd absolutely loved them the last time I brought cakes in. They're based on the VCTOW recipe, but I've been tweaking it a little, coz I'm like that.